Now you can protect your suitcase with this amazing looking Fly Around The World Suitcase Cover. The suitcase cover is available in many sizes and is flexible so that it will fits tight around your luggage making it look amazing while making it more difficult for people to steal your stuff and protecting your suitcase too. 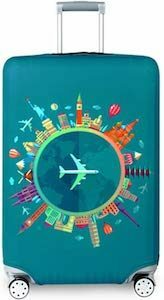 This suitcase cover shows a world map in a circle with a airplane in the middle and on the edge of the circle your can find many famous buildings from around the world and even some smaller planes flying above them. It is a great lookin cover that will work great on your suitcase while keeping your handles and wheels all working as expected. 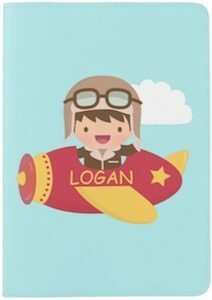 This is just a cute and fun passport cover that would be great for kids and adults. 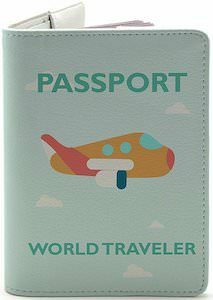 On the front, the passport holder shows an airplane flying between the clouds and it also says “Passport” and “World Traveler”. Inside the passport cover, it offers room for your passport but also room for some other things like cards and notes so that you maybe can store your ticket and your frequent flyer card together with your passport. A passport cover like this is great at the job and will keep your passport in new condition and easier to find the right one in a stack all thanks to the nice design. If you want everyone to know what a world traveler you are then you just need a suitcase that says it and this world traveler suitcase does say it. You can get this suitcase in 3 sizes from cabin luggage to real big and you can make it more personal by choosing cool colors for bumpers, handles, and wheel covers and that way it becomes more fun to look at. 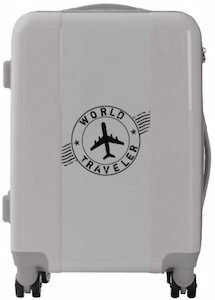 On the front of the suitcase, you can see a logo with an airplane in the middle and on the circle around it, you can find the text “World Traveler”. A passport cover is a great way to protect your passport from damage and to make it easier to find yours in the stack of family passports. 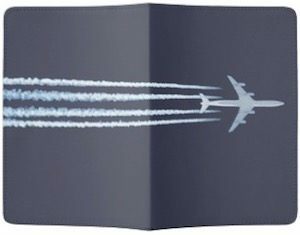 This passport cover is dark blue in color and on it, you can see a plane in the sky with a contrail behind it and the vapor trail goes all the way from the front to the back. And if you like you can personalize the cover at no extra cost with your initials that then will be printed on the front in the right lower corner. This luggage tag tells you how it is when you go flying in a plane. On the front of the baggage tag, it says “OMG 35,000FT. Above the Earth!” and that is the height most planes will fly when they are cruising to their destination. Besides the front, there is the back of course which has the same yellow color but with room for your ID card so that airlines will know where to bring your suitcase just in case it gets lost. 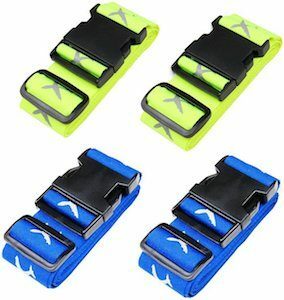 So get your luggage tagged up with this luggage tag that knows how high it will go and by having this special bag tag it will also be easier to see your luggage coming down the belt. This luggage tag is all about getting ready for a trip. On the black luggage tag it says in big letters “Here We Go!” and then besides those words you can find an airplane flying in. On the back the same plane shows and below it you can find you information printed on it. If you want just a slot for your address card then that is an option to. A luggage tag like this is fun and perfect for your summer holidays. No longer do you have to worry about loosing your luggage as this luggage tag is just perfect at knowing where you luggage is.